TNS did a series of polls in several European countries (see this writeup from Alberto Nardelli at Buzzfeed) showing that most Europeans (at least, in the countries polled) hope and expect that Britain will vote to stay, though the French narrowly expect Brexit. 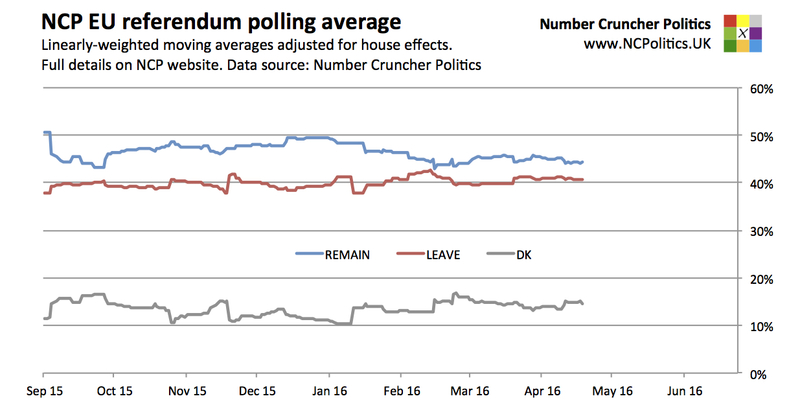 In the UK section, Remain jumped into a four-point lead, compared with a dead heat in the previous TNS poll. MORI’s poll also provided some insight into the priorities of voters on each side. I say insight, but it can’t come as too much of a surprise – Leavers are more worried about immigration, Remainers are more concerned with the economy. It’s also caused some relatively big moves in the numbers. Because there are relatively few phone polls, MORI polls have a high weighting, so the swing in the poll, compounded by the recalculation of the house effects, plus the big move in the TNS poll, between them increase the Remain lead by about a point to just under four points. The forecast model now has Brexit probability down to a little over 21%, while the most likely outcome now has Remain moving above 56% of the final vote. The the main NCP EU referendum page for more. Finally, tickets have gone on sale to the BBC’s referendum debate on June 21st (two days before polling day). Update (23:50): ComRes has a poll out for the Mail and ITV News, showing an even more decisive swing toward Remain than the other two. This will be included in the average and forecast from tomorrow.